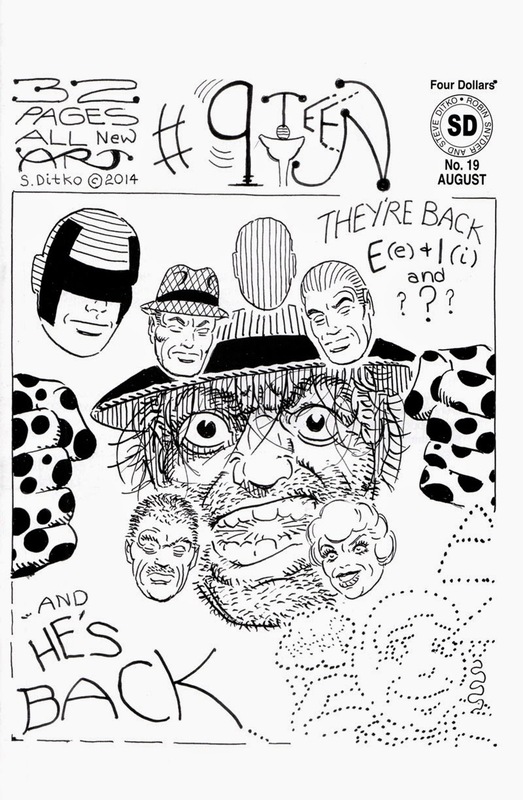 Now available, Ditko's #9 TEEN, the latest in Ditko's series of all-new 32-page comics. Returning features include The Madman, E (e) & I (i), The Hero, The Trapper, plus a few other features. There's also a very short new essay in Ditko's current series ("#28: Red Flag") and an acknowledgement of the Kickstarter backers. Said backers should have copies now or soon. As usual, all the new books and various other Ditko publications are available directly from Robin Snyder, details here, and the new book should be available from retailers who order from Snyder now or in the near future (interested retailers should contact Snyder for terms, which are probably better than you get for similar comics from your main distributor).